Instructions: Click here to view a larger photo of this project. Diecut from Oakberry Lane Paper Collection and white cardstock, using tag die from Album Tags and Accents Die using both sizes. Adhere the larger one to white paper and two others on both sides of tag. Cut one tag using smaller die and using Ornamental Tags Die create a tag, cut the bottom with the lade edge. Place on tag using 3d foam tape. Cut out sentiment using combination white and collection paper as shown and place using 3d tape. To create flowers Stamp the Classic Rose Cling Stamp Set on paper with waterproof red ink and cut using the coordinating dies. Colour with pink pigment ink. You will need two petals for each flower to create flowers. Sponge the petals with dries clear adhesive and sprinkle with Ultrafine transparent glitter. Use the 3D Rose Shaping Mold to shape flowers. For more tips on creating with the flower shaping molds, watch the tutorial at https://youtu.be/FSdPL7nXvQE. Layer the petals together using the hot glue gun making sure to offset them. Use a paper piercer to make a hole in the middle and pull through the stamens from the set. Add a little hot glue to the underside of the flower to adhere. Stamp the leaves using Leafy Accents Cling Stamp Set on the white paper with StazOn Ink Pad - Olive Green, cut out with the coordinating die, shade using the same ink and shape. Shape leaves using Leafy Accents Shaping Mold. Adhere the flowers and leaves using a hot glue gun. 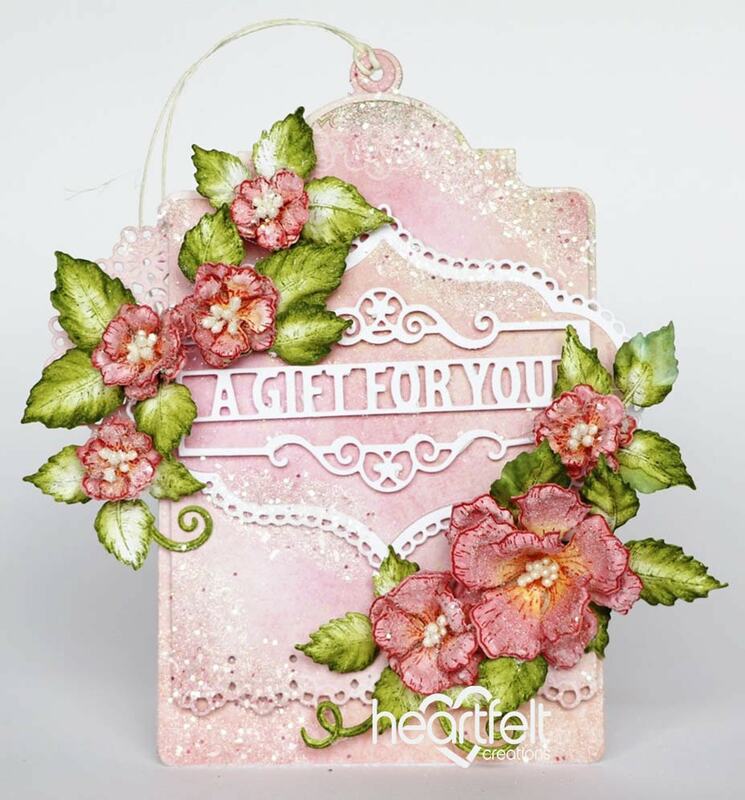 Sponge the petals with dries clear adhesive around card and sprinkle with Rajni Chawla's Crystal Clear glitter.